A unique guide to our amazing native trees, this book features common and notable trees growing at 4,500 feet or more in the Sky Islands of southern Arizona. 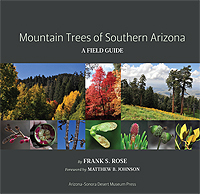 Unlike field guides of the past, it uses the same approach as Frank Rose's heralded Mountain Wildflowers of Southern Arizona, providing not only a large image of each tree, but several smaller images of their components--such as bark, fruit, flowers or cones in various stages of development, as well as occasional photos of animals that find resources in those trees. Coupled with the text, these images make it easy for beginners and afficionados alike to distinguish between the species--even the often confounding pines and firs. In addition to striking photos and an elegant, easy-on-the-eye design, this guide provides brief entries describing such features as overall shape, height, elevation range, preferred habitat, bark, leaf, flower, and fruit. A short narrative paragraph expands on these vital statistics and descriptions, often providing anecdotal information about how the tree is or has been used by people or animals, especially butterflies. With spiral-binding and laminated covers, the book is easy to use in the field. But its array of photos, straightforward language, and concise information will satisfy the amateur naturalist in all of us, even if it never leaves the coffee table. Note: In the credits for Mountain Trees of Southern Arizona, butterfly photographs graciously donated by Mary Klinkel were mistakenly and regrettably credited to her husband, Fred Heath, along with several that he contributed, and for which he is credited. Mary's images are as follows: ceraunus blue, pg. 41; Chiricahua white, pg. 23; Colorado hairstreak, pg. 51; Juvenal's duskywing, pg. 45; Leda ministreak, pg. 41; red-spotted purple, pg. 71; Siva juniper hairstreak, pg. 5; and two-tailed swallowtail, pg. 63. "For those of us fascinated by the Sky Islands of the Sonoran Desert Region, this much-needed field guide will be a valuable addition to our backpacks. We now have a portable guide, specific to our unique forests, that allows quick and easy field identification. Written for the amateur naturalist, the book provides a concise and complete description of tree biology, distribution and ecosystem variations, and identification tips. [This guide is] a good resource for anyone who loves the Southwest forests." "This is the book I wish I'd had several years ago, when I first began studying the Sky Islands of Arizona. It is scientifically accurate, yet accessible to the lay reader. If you love trees, or just want to know what tree you're sitting under while you picnic on Mt. Lemmon (or any other Sky Island), this is the book for you. Easy to use, richly illustrated, and downright fun to use." Wendy Moore, Curator of the University of Arizona Insect Collection and co-author of A Natural History of the Santa Catalina Mountains (currently in production). "A unique tree guide with outstanding photographs showing the distinctive characteristics of species in our southern Arizona mountains." Anne Orthe Eppel, author of A Field Guide to Plants of Arizona. Frank S. Rose is an avid amateur botanist and active member of the Arizona Native Plant Society. He is a lifelong artist and president of the Southern Arizona Watercolor Guild. In recent years, he has devoted himself to his art, combining it with his interest in botany. A retired pastor, he is also the author of Wildflowers of Southern Arizona: A Field Guide to the Santa Catalina Mountains and Other Nearby Ranges published in 2011 by the Arizona-Sonora Desert Museum Press. He illustrated Herbal Medicine of the American Southwest by Charles W. Kane, published by Lincoln Town Press in 2006.